Alfonso de Albuquerque (or Afonso d'Albuquerque - disused) (pronounced [ɐˈfõsu dɨ aɫbuˈkɛɾk(ɨ)]) (treated with a Don by some although his birth didn't entitle him to that treatment) (1453, Alhandra - Goa, December 16, 1515) was a Portuguese fidalgo, or nobleman, a naval general officer who, by his military and administrative activities, conquered and established the Portuguese colonial empire in the Indian Ocean. After gaining military experience in North Africa, in 1503 he set out on his first expedition to the East, which was to be the scene of his future triumphs. In company with his kinsman Dom Francisco da Alameda, he sailed round the Cape of Good Hope to India and succeeded in establishing the king of Cochin securely on his throne. In return for his services, he obtained permission to build a Portuguese fort at Cochin, thus laying the foundation of his country's empire in the East. In November 1509, he became the second viceroy of the State of India, a position he held until his death. In 1510, he took possession of Goa and set up an administration there, intending to use it as a base to dominate the Muslim world, assume active control of the spice trading network, and establish permanent fortresses with settlements. His last warlike undertaking was a second attack upon Ormuz in 1515. The island yielded to him without resistance, and it remained in the possession of the Portuguese until 1622. Alfonso de Albuquerque was born in Alhandra in the year of 1453, near Lisbon, Portugal, to Gonçalo de Albuquerque and Dona Leonor de Menezes. Through his father, Gonçalo de Albuquerque, Lord of Vila Verde dos Francos, who held an important position at court, he was connected by remote illegitimate descent with the royal family of Portugal. His paternal great-grandfather and grandfather had been confidential secretaries to kings John I and Edward (Duarte), and his maternal grandfather had been Admiral of Portugal. He was educated in mathematics and classical Latin at the court of Afonso V of Portugal, and after the death of that monarch, seems to have served for ten years in Arzila, Morocco, where he acquired military experience. He was present at Afonso V's conquest of Arzila and Tangier in 1471. On his return, King John II (ruled 1481–95) appointed him estribeiro-mor (chief equerry, "Master of the Horse"). In 1489, he participated in North Africa at the defense of Graciosa. Under John's successor, Manuel I, Albuquerque was less prominent at court but served in Morocco again. 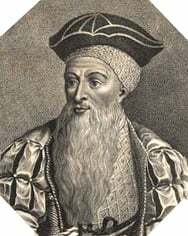 In 1499, when Vasco da Gama returned to Portugal from his pioneering voyage around the Cape of Good Hope to India, King Manuel straightway sent a second fleet under Pedro Álvares Cabral to open relations and trade with the Indian rulers. The Muslim Mughal traders who had monopolized the distribution of spices turned the zamorin, or Hindu prince of Calicut, against the Portuguese. His dependency, the kingdom of Cochin, on the southwestern Indian coast, however, invited the Portuguese to conduct trade. In 1503 he set out on his first expedition to the East, which was to be the scene of his future triumphs. In company with his kinsman Dom Francisco da Alameda, he sailed round the Cape of Good Hope to India, and succeeded in establishing the king of Cochin securely on his throne, obtaining in return for this service permission to build a Portuguese fort at Cochin, and thus laying the foundation of his country's empire in the East. Albuquerque returned home in July 1504, and was well received by King Manuel I of Portugal. In 1505, Manuel appointed Dom Francisco de Almeida first governor in India, with the rank of viceroy. Almeida's object was to develop trade and aid the allies of the Portuguese. In 1506, Albuquerque was entrusted with the command of a squadron of five vessels in the fleet of 16, which sailed for India under Tristão da Cunha. They left Lisbon in April 1506, to explore the east coast of Africa and build a fortress on the island of Socotra to block the mouth of the Red Sea and cut off Arab trade with India. After a series of successful attacks on the Arab cities on the east coast of Africa, Albuquerque separated from Tristão, and sailed with his squadron against the island of Ormuz, in the Persian Gulf, which was then one of the chief centers of commerce in the East. He arrived on September 25, 1507, and soon obtained possession of the island, though he was unable to maintain his position for long. He was responsible for building the Portuguese Castle on the island of Hormoz. With his squadron increased by three vessels, he reached the Malabar coast at the end of 1508, and immediately made known the commission he had received from the king empowering him to supersede the governor Dom Francisco de Almeida, though without the rank of Viceroy. Almeida had succeeded in crushing the makeshift navy of Calicut, but his son had been killed by an Egyptian navy. He insisted on retaining power until he had avenged his son’s death, and, refusing to recognize Albuquerque's credentials, cast him into prison. In February of 1509, Almeida defeated the Muslims off Diu, and only released Albuquerque on the arrival of the grand-marshal of Portugal with a large fleet, in November 1509. After Almeida had returned home, Albuquerque speedily exhibited his energy and determination. He became the second viceroy of the State of India, a position he held until his death. Albuquerque intended to dominate the Muslim world, assume active control of the spice trading network, and establish permanent fortresses with settlements.An attack on Calicut (modern Kozhikode) in January, 1510, was unsuccessful, and the commander-in-chief was severely wounded. Albuquerque realized that it would be better to overcome the Muslims, and took 23 ships to attack Goa, assisted by a powerful corsair named Timoja. He occupied the town in March 1510, but was unable to hold it and was forced out by Muslim army in August. He returned with reinforcements in November, and obtained undisputed possession. Albuquerque planned to use Goa as a naval base against the Muslims, and as a port for the spice trade and for the supply of Persian horses to the Hindu princes. He intended to create a new population for Goa by marrying his men to the widows of his victims, and to set up a government over surrounding village communities which would assure Goa of adequate supplies. In 1512 he sailed for the coast of Malabar. On the voyage a violent storm arose, Albuquerque's vessel, the Flor do Mar, which carried the treasure he had amassed in his conquests, was wrecked, and he himself barely escaped with his life. In September of the same year he arrived at Goa, where he quickly suppressed a serious revolt headed by Idalcan, and took such measures for the security and peace of the town that it became the most flourishing of the Portuguese settlements in India. He set up a system of licenses to gain control over trade. Albuquerque had been under orders for some time, from the home government, to undertake an expedition to the Red Sea, in order to secure that channel of communication exclusively to Portugal. He accordingly laid siege to Aden in 1513, but was repulsed; and a voyage into the Red Sea, the first ever made by a European fleet, led to no substantial results. In order to destroy the power of Egypt, he is said to have entertained the idea of diverting the course of the Nile River and so rendering the whole country barren. Returning to India, he finally subdued Calicut, which had raised the greatest opposition to the Portuguese. His last warlike undertaking was a second attack upon Ormuz in 1515. The island yielded to him without resistance, and it remained in the possession of the Portuguese until 1622. Albuquerque had several enemies at the Portuguese court who lost no opportunity to stir up the jealousy of King Manuel against him, and his own injudicious and arbitrary conduct on several occasions only aggravated the situation. In September he was taken ill in Ormuz, and set sail for Goa. At the entrance of the harbor of Goa, he met a vessel from Europe bearing dispatches announcing that he was superseded by his personal enemy Lopo Soares de Albergaria. The blow was too much for him and he died at sea on December 16, 1515. Before his death he wrote a letter to the king in dignified and affecting terms, vindicating his conduct and claiming for his son the honors and rewards that were justly due to himself. His body was buried at Goa in the Church of our Lady. The king of Portugal was convinced, too late, of his fidelity, and endeavored to atone for the ingratitude with which he had treated him by heaping honors upon his natural son Brás de Albuquerque (1500—1580). In 1576, the latter published a selection from his father's papers under the title Commentarios do Grande Affonso d'Alboquerque which had been gathered in 1557. Alfonso de Albuquerque was for some time known as The Great, The Caesar of the East and as The Portuguese Mars. An exquisite variety of mango, that he used to bring from Brazil on his journeys to India, has been named in his honor, and is today sold throughout the world as Alphonso mangoes. ↑ Barbara Watson Andaya and Leonard Y. Andaya. (1984) A History of Malaysia. (London: Palgrave, ISBN 0312381212). ↑ Lauren Benton. (2001) Law and Colonial Cultures (Cambridge University Press). ↑ Hans Erich Stier, (1942) Die Welt als Geschichte: Zeitschrift für Universalgeschichte (W. Kohlhammer). ↑ Jack D. Forbes. (1993) Africans and Native Americans (University of Illinois Press, ISBN 025206321X). Albuquerque, Afonso de, and Walter de Gray Birch. The Commentaries of the Great Alfonso Dalboquerque, Second Viceroy of India. Works issued by the Hakluyt society, no. LIII, LV, LXII, LXIX. New York: B. Franklin, 1963. Albuquerque, Alfonso de. The Commentaries of the great A. Dalboquerque. Works issued by the Hakluyt Society, 1875. Nos. 53, 55, 62, & 69. Benton, Lauren. Law and Colonial Cultures, Cambridge University Press. 2001. ISBN 052100926X. Forbes, Jack D. Africans and Native Americans, University of Illinois Press. 1993. ISBN 025206321X. Hunter, William Wilson. Comprehensive history of Indian empire. Delhi, India: Anmol, 1986. Afonzo de Albuquerque Catholic Encyclopedia. History of "Afonso de Albuquerque"
This page was last modified on 16 February 2016, at 17:27.